Advance Tickets (for all types of seating) can be purchased online from our website through our partnership with Eventbrite. Visit our Tickets page for more details. General Admission tickets may be purchased, as of August 1, at the Rancho Cordova Chamber of Commerce or at the Airshow gates. What is the difference between general admission tickets and premium seating/chalets? General Admission tickets simply get you in the gate to the Airshow. You are responsible for your own seating during the show. Grandstand Open Seating area includes multiple bleachers with an elevated view of the show, private restrooms, food and beverage concessions available for purchase and friendly volunteers to assist you throughout the day! Mather Club chalet provides indoor and outdoor seating areas along the front line allowing you a great view of the Airshow, private restrooms, and food and beverage available for purchase. Flight Line Club provides many great benefits, including indoor and outdoor seating areas, private upgraded restrooms, catered food and beverages from 11am-2pm. Capital Club is our VIP chalet at Airshow center that includes indoor and outdoor seating areas, catered food from 11am-2pm, endless non-alcoholic beverages and an open bar for your enjoyment. Visit our Tickets page for more details. Purchase early for best pricing! Can I use my Sunday premium seating/chalet tickets on Saturday instead? No. You must use the reserved Mather Club, Flight Line Club and Capital Club tickets for the day for which they are purchased. The premium venue areas have limited seating and tickets are sold for the number of seats available each day. With advance notice, you may be able to contact our Ticket Center at 916-876-7568 and request an exchange. General Admission tickets are good for either Saturday or Sunday. Where can I purchase an airplane ride? Rides in a B-17, T-6 Texan or P-51 Mustang can be purchased online here! Buy your ride BEFORE the airshow and SAVE BIG!! 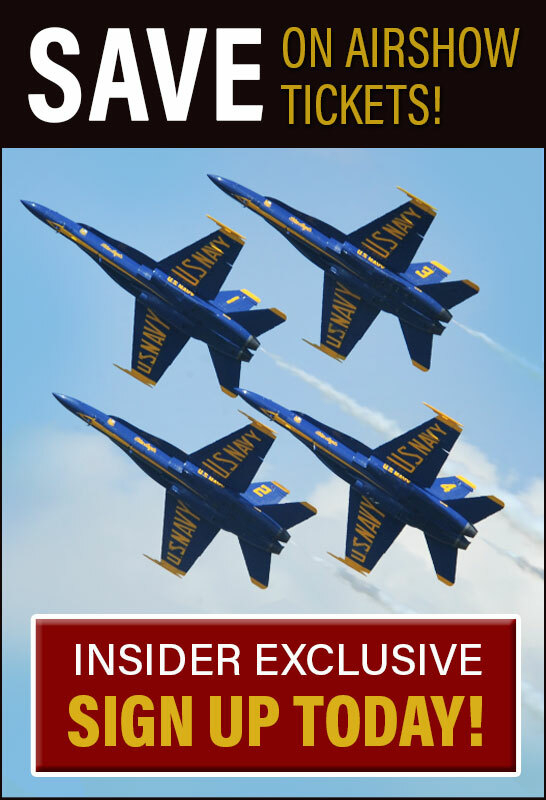 Do active duty military personnel have to pay to attend the airshow? We support our troops both past and present! Retired and Active Duty Military can purchase tickets at the Beale and Travis ITT offices for a deep discount. Please contact each office for hours of operation and ticket pricing. Discounted military tickets will not be available at the Airshow gate, so plan ahead and purchase your discounted tickets in advance! All proceeds from military member ticket sales go directly to fund Airshow scholarships awarded annually to students pursuing college education in fields of science, technology, engineering mathematics, aviation or aeronautics. No, parking is not free. ONLY CASH WILL BE ACCEPTED FOR PARKING.The fee for each vehicle is $10 and does not include exit and re-entry. Purchase online now to save time at the gate! Each Adult General Admission ticket includes 4 FREE Youth/Children (ages 15 and under) tickets. Also, children 5 years old and under are free for General Admission tickets only. If more children are attending than what is covered with purchased Adult General Tickets, you will need to purchase Youth/Child’s tickets. For all other ticket options (Grandstands, Mather Club, Flight Line Club, Capital Club) a ticket is required for ages 2 and up. Please check our Tickets page for additional information and current ticket prices. What if I can't find my Eventbrite tickets? The easiest way to get your tickets is to find your email order confirmation; tickets are usually attached as a PDF file you can print. Can’t find them, having trouble printing, or not sure if you have an Eventbrite account? Just enter your email address at eventbrite.com/gettickets. Does the airshow accept credit cards or checks at the gate? The Airshow accepts cash and credit card for Airshow admission tickets. Only cash will be accepted for parking. Yes, we do offer Grandstand/bleacher seating. Please visit our Tickets page for available seating and ticket options. Yes, premium ticket options are available for purchase. Please see our Tickets page for current pricing and availability. Mather Airport is located just 10 miles from downtown Sacramento and adjacent to Rancho Cordova. For accurate directions depending on your location please use Google Maps. Driving directions can also be found here. Yes! A limited number of general aviation pilots will have access to Fly-In privileges during non-waivered airspace for the day or for Saturday & Sunday. Please see our Fly-In page for more information. Check out the local hotels through the Rancho Cordova Travel and Tourism website. Parking is $10 CASH. ONLY CASH WILL BE ACCEPTED FOR PARKING. The fee for each vehicle is $10 and does not include exit and re-entry. Purchase online now and save time! Yes. You must have a handicapped plate or tag in the car and make sure the parkers flagging your car are aware of your handicapped status. They will direct you to the handicapped parking areas. Handicapped parking is limited and is on a first-come-first-served basis. Please arrive early to insure a parking spot. A map to these areas may be found on the Directions & Parking page. Yes. There is a small, hard-top surface for motorcycle parking. Parking lot attendants will direct you to the specific area. Motorcycle parking is limited and is on a first-come-first-served basis. Please arrive early to insure a parking spot. No. Even if you have purchased tickets, loitering is not permitted in the parking lots. Yes, FREE bicycle parking is available at the Airshow. Once you enter the parking lot, the attendants will direct you the designated bicycle parking area. What public transportation options are there for the airshow? For Regional Transit rates and bus and train schedules, please visit the Regional Transit website. There is no additional bus or light rail services from Mather Mills Station to Mather Airport. California Capital Airshow tickets are not valid as a form of payment for Regional Transit. May I leave and re-enter the airshow during the day? Can I bring a scooter / wheelchair / golf cart? Due to security concerns, large coolers (exceeding 9 Quarts and/or 10in. x 12in. x 11in.) and large bags ARE NOT permitted on the show site. Small coolers (smaller than 9 Quarts / 10in. x 12in. x 11in.) ARE permitted. All personal handbags, totes, diaper bags, etc. are subject to search at the entry gates. Baby food, pre-packaged/sealed snack food and whole fruit are allowed into the Airshow. Homemade items, such as sandwiches, are not permitted. For the safety of attendees and the animals, pets are not allowed on show grounds. Certified service animals are permitted, this does not include companion animals. Due to security and safety concerns, tents, beach umbrellas, awnings and the like are not permitted on show grounds. Personal, hand-held umbrellas, not to exceed 48 inches in diameter, are permitted. Can I bring a stroller for wagon for my kids? Yes, small strollers and wagons are permitted. However, they will be subject to search. In the interest of everyone’s safety, the California Capital Airshow is a no drone zone. In accordance with FAA issued Temporary Flight Restrictions, drone operations will be prohibited within 5 miles of Mather Airport Thursday, September 20 – Sunday, September 23. Yes, multiple ATMs are available throughout the Airshow. From supersonic-speed jets to gravity-defying aerobatic acts to wing-walkers, parachutists, and a host of on-the-ground displays and activities, a day at the Airshow is a fantastic and memorable experience, whether you’re an avid aviation fan or just love a great show. Tens of millions of spectators attend air shows every year, and the air show industry represents one of the very largest, — if not the largest — outdoor professional sports in North America. Moderately priced for families and individuals of all ages, this is one show you won’t want to miss. Buy your tickets today! September 21, 22 & 23, 2018. Friday night the Airshow gates are open 5pm-10pm, with flying performances from 6-8pm and ‘Wonder Bread 5’ concert from 8-10pm. Airshow gates open at 9:00 a.m. and close at 5:00 p.m. Saturday & Sunday, Flying performances are 12:00 – 4:00 p.m. each day. Can I take an airplane ride at the airshow? YES, you can purchase a ‘ride of a lifetime’ in a B-17 Flying Fortress, T-6 Texan or P-51 Mustang at the Airshow! Purchase and get more information here! What time does the airport close to non-airshow air traffic? Mather Airport will close to air traffic at 7:00 a.m. on the Friday preceding the show and remain closed until Sunday evening. A list of performers is listed on the Performers page. Unfortunately, the schedule is not solidified until the morning of the Airshow to allow for security, safety, weather and operational concerns. Is the airshow the same for both days? The Friday Night Show is different from the Saturday & Sunday Airshow, the USAF Thunderbirds & F-35 will not fly. Generally, yes, the show is the same. However, there may be some variations depending on special aircraft, which may make only a one-day fly-by appearance. More information may be found on our Performers page. Shaded areas are available in Mather Club, the Flight Line Club and the Capital Club — specific tickets are required for these areas. For General Admission, limited shade may be found under the wings of static display aircraft but is limited. Guests are encouraged to bring sunscreen, hats, sunglasses and portable, hand-held umbrellas for their comfort. Can I meet the pilots? Yes! Many of the feature pilots and crew make themselves available before or after their performances to meet their audience. Many of the WWII-era and military crews are at their aircraft during static viewing times and are happy to answer questions and pose with you for photos. There is also an Autograph Tent near show center. Airshow performers will stop in before or after their performances. The Airshow strongly encourages you to bring and use proper hearing protection such as quality ear plugs, and especially so for children. The noise from the jet engines and pyrotechnic explosions may be painful or harmful for some. This is especially true if you are viewing the show from the front line. For young children who may tend to play with and/or remove the foam type plugs, a suggested alternative is sound muffs (available at most sporting goods stores, and generally available in children’s size). Please make your own choices on this matter and protect your hearing. The airshow has made every effort to accommodate those with special needs. Some of the accommodations offered include, a handicap parking area and ADA portable restrooms. The event space is mostly concrete and maneuverable with a wheelchair/scooter/walker etc. The event space is EXTREMELY LARGE, so make sure to plan for breaks throughout the day and assistance as needed. Will the airshow be televised? The Airshow will not be televised and unauthorized broadcast of the show is prohibited. To see all aspects of the Airshow, you need to attend. It takes more than a few drops of rain to stop the California Capital Airshow! The Airshow will take place — rain or shine both Saturday and Sunday. Airshow performers have high, low and flat routines to adapt to varying weather conditions. Schedules may be altered or delayed for periods of time if heavy rainfall occurs. All display aircraft, concessions and exhibits will be open regardless of weather. What food is commonly found at an airshow? The Airshow will have a large variety of food available for purchase, including local barbecue, local cuisines, fried food specialties, dessert specialties, signature salads, boxed lunches, reception stations, and other concession services, all representative of the spirit and flavor of Sacramento. What are recommended items to bring to the airshow? Portable chairs, strollers, cameras, sealed bottles of water, cash for concessions (ATMs are also available), sunscreen, earplugs, blankets and handheld umbrellas (less than 48 inches in diameter) are items air show veterans tend to pack. What items are prohibited from being brought into the airshow? The following items are prohibited from the Airshow grounds: large coolers(exceeding 9 Quarts and/or 10in. x 12in. x 11in. ), loose ice, cans, glass, alcohol, pets, weapons of any kind, tents, awnings, cooking/barbecue equipment. Please note cooking and barbequing equipment are NOT allowed in the parking lots (for example, you are not allowed to barbeque in the parking lot for lunch). No. Smoking is not allowed anywhere on the ramp or in the grass parking areas. Can I use my California Capital Airshow ticket stub as payment for regional transit? No, California Capital Airshow tickets are not valid as a form of payment for Regional Transit.